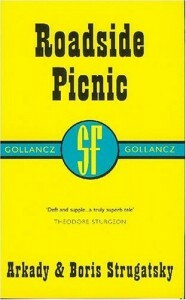 Roadside Picnic is one of my favorite books. Six locations around the world exhibit unearthly phenomena, presumably caused by alien intervention. Dispersed in these so-called zones are various strange objects. The function of some is understood at least superficially while others remain enigmas. Access to these Zones is restricted, but thieves called stalkers break in to poach these valuable items. The book follows the adventures of one such stalker, Red Schuhart. Often in Science Fiction, when faced with a strange phenomenon, the main characters make educated guesses about its nature that often turn out to be surprisingly insightful. Roadside Picnic eschews this trope almost totally. There is some interesting speculation about the nature of the Zones which gives rise to the name of the book, but ultimately the reader is left to ponder their mystery. The stalkers aren’t scientists. They are more like rats in a maze, learning by trial and (fatal) error. This creates tremendous tension throughout the novel, If you like good SF, this book is a must.